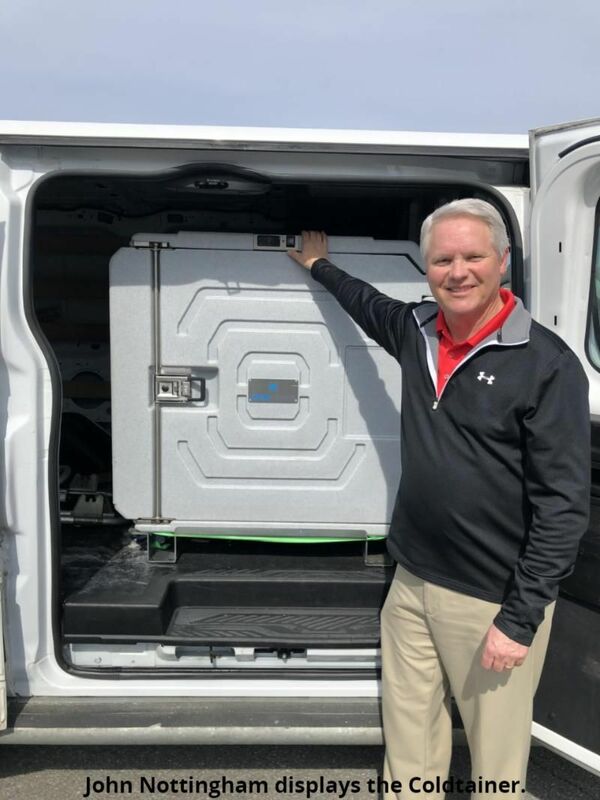 With a fleet of 15 delivery vehicles, Palace Vending in Kingsport, Tenn. has found significant savings from installing portable refrigerated containers in its vehicles. The refrigerated containers from Coldtainer reduce maintenance and improve fuel economy, according to John Nottingham, president of the company, which supplies snacks, beverages, office coffee, water and catering services to businesses and schools throughout northeastern Tennessee, southwest Virginia and in the greater Asheville, N.C. area. To transport fresh products on longer runs across its service area, Palace Vending used medium-duty box trucks equipped with coolers and compressor powered cold plate refrigeration systems. The trucks cost about $65,000 each and average about 10 miles per gallon. In August 2018, the company purchased a Ford Transit cargo van and outfitted it with a Coldtainer FO720 NDN 25 cubic-foot front opening direct expansion refrigerated container model. The unit was purchased through a rebate program from Unified Strategies Group (USG), a nonprofit purchasing cooperative servicing independently owned vending, office coffee service, micro market and foodservice companies in the U.S.
At a lower initial cost of about $40,000, the first cargo van and Coldtainer unit fielded by Palace Vending provided an immediate capital cost savings compared to about $65,000 for a medium-duty truck equipped with a cooler and a compressor powered cold plate system. Coldtainer containers provide a versatile solution for the transportation of perishable goods that require precise temperature control and freeze protection. The containers are available in front opening or top loading models in a range of capacities and with numerous cooling, freezing and heating options. The units can use battery, shore and solar power sources on vehicles and at facilities to operate on AC or DC power. Equipped with refrigeration units designed to withstand vibrations related to vehicle use, Coldtainer stand-alone containers are made from molded polyethylene and food-grade materials. The units are easy to clean and comply with health and safety standards. All Coldtainer temperature-controlled models have an integrated battery monitor and a user-friendly digital display to view temperature and status, and for precise temperature set point control. The containers also record temperatures and have a mobile Bluetooth capability for downloading data to meet recordkeeping requirements. The cargo van operates at almost double the fuel efficiency of a traditional medium-duty truck, and maintenance costs on the vans are also significantly lower. Palace Vending plans to add as many as five larger van models to its fleet over time. The Coldtainer units will continue to provide measurable fuel cost savings, and will have the same cubic capacity as the company’s medium-duty trucks. Coldtainer is a registered trademark of Euroengel, an Italy-based company that has been designing and manufacturing 12V portable refrigerators since 1993. For more information visit https://www.coldtainerusa.com/, 877-757-5974, info@coldtainerusa.com.